A convoy of military vehicles came along in a nick of time. Graduating Captain Career Course. Distinguished Honor Grad. 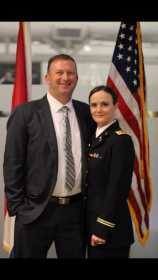 The convoy was not headed for battle but helped to confront a lengthy conflict within Crystal Cecil, a lieutenant with the Missouri Army National Guard and new Officer in Charge of Southeast’s Show-Me Gold program. Cecil was driving with her then 17-year-old daughter, Brittany Ellis, on their way to see Cecil’s father in 2013 when they came upon the convoy. Crystal had dreams of joining the military while in high school but had become pregnant at 17 with Brittany. Crystal knew from the start that she didn’t want someone else raising her daughter, so dreams of going to college and joining the Army were put on hold. The convoy prompted a conversation between mother and daughter, and Crystal explained her dreams, the circumstances about getting pregnant and not enlisting. Brittany told her mother, then 34, she always would feel she held her back from a dream if she didn’t go at least speak to a recruiter. That’s exactly what Crystal ended up doing. It ended up being timed perfectly. The cut-off age to enlist is 35, and Crystal was just a few months shy of her 35th birthday. She celebrated her birthday while at basic training. Despite being teased for her age, Crystal ended up being a blessing in disguise for many of her peers. She said many platoons will have at least one person who’s older and will fill a parental role to the 17- to 22-year old enlistees who are away from home for the first time. Crystal missed her daughter tremendously, but she got to tell stories about Brittany to the female soldiers to ease her homesickness. Brittany got to see the strength, confidence and accomplishments from girls with similar ages and upbringings. Crystal still had some time before she figured out what Brittany was up to. Crystal recalled one night when she and her husband were out to eat, Brittany put on her mom’s patrol cap and Army combat uniform top took a photo in front of the mirror and posted it to Instagram. Brittany said she was nervous to bring it up to both of her parents, but they both pushed her to go for it. However, Crystal wasn’t sure how serious her daughter was about enlisting until she was in Advanced Individual Training (AIT). Crystal was still moving up the ranks and wasn’t planning on slowing down just because Brittany enlisted. There was a new program at Southeast and she wanted in on it. The Show-Me Gold program was a semester old when Crystal joined in Spring 2014. She was set to go to Officer Candidate School (OCS) in May 2014, so she had to cram three to four years of preparatory information into 16 weeks. Crystal would end up being the first woman in the Southeast Show-Me Gold program to graduate that spring. The next set of women wouldn’t graduate until 2018 and Brittany was in that group. Being involved in the infancy stage of the program was beneficial to Crystal. She got to see what the program was and what it could end up becoming. She stayed close with the program, eventually landing a job as a staff member in 2014. In Spring 2019, Crystal took over the role as Officer in Charge of the Show-Me Gold program. Crystal said she enjoys using her passion for mentoring young people as the Officer in Charge. An overwhelming factor the officer candidates have is knowing they will be responsible for up to 42 soldiers in their first platoon, Crystal said. “You have to make sure that the population of kids that you have in this class understand how big what they are doing is,” Crystal said. She said keeping them motivated and encouraging them not to get frustrated to avoid feeling like they have to know everything is a big challenge. Crystal said her daughter used to have a hard time comparing herself to her mom but has slowly shifted her mindset. Instead of saying she could never amount to Crystal’s leadership and accomplishments, Brittany now asks about professional development and what to ask her commander. Crystal said the biggest changes in the program won’t come from curriculum alterations but from adjusting how to motivate and encourage the candidates. “There’s nothing that I can teach them here that will make them more successful at OCS because it’s really about grit, how bad do you want it, how much heart do you have to keep going,” she said. As the youngest of five children in a low-income family and a teenage mother, society told Crystal she could never make it to where she’s at now, but she’s proving society wrong. This year, she plans to move up a rank to captain and one day hopes to make major.